Purim is just around the corner, and with it comes gift giving and festivities galore. Not to mention it is a fabulous time of feasting in celebration of the miraculous rescue of the nation of Israel, despite the plot of the evil lord Haman. However, you know just like we do, that sugary desserts just are not the best for your health. Oh boy… wouldn’t it be nice if they were! So today, in honor of Purim, we have decided to post a recipe that both sweet lovers and health-conscious consumers can truly enjoy. This dense tea cake is made with olive oil and packed with loads of flavor, while also remaining low in processed sugars. Who wouldn’t love that! AND we should also mention, that it is beautiful—it will wow dinner guests EVERY time. Preheat oven to 350 degrees, and lightly oil a 9 inch cake pan. Lay thinly sliced figs evenly over the bottom of the pan, overlapping slightly. Set aside. Sift flours, salt, baking soda, baking powder, and ginger into a large bowl. Open the cardamom pods, and grind the seeds in a spice grinder, mortar and pestle, or in a bowl with the back of a spoon—they don’t have to be fine, just broken up. Add them to the dry ingredients, and stir to combine. Set aside. In another bowl, beat the eggs, honey, sugar, and zest until fluffy and pale. Add the buttermilk and jam, and beat to combine. While mixing, drizzle in the olive oil—the mixture will be quite thin, but don’t worry. Fold dry ingredients into the wet, until barely moistened. 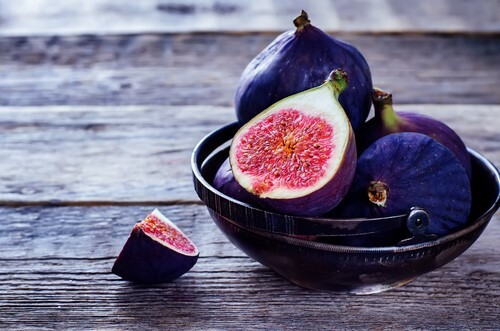 Pour into prepared pan, over the top of the figs. Bake for about 30-35 minutes, or until a toothpick comes out just barely clean, being careful not to over-bake. Transfer the pan to a wire rack to cool for at least 30-40 minutes. Adding extra virgin olive oil to your diet is an excellent way to boost overall health. My Olive Tree not only provides an excellent bottle of EVOO, but the proceeds from this product go towards meeting various humanitarian needs within the nation of Israel, and beyond. Purchase your bottle today!